Cheap Superhero Slide Puzzles - 8 Ct.
Fun party favor for any superhero themed event! 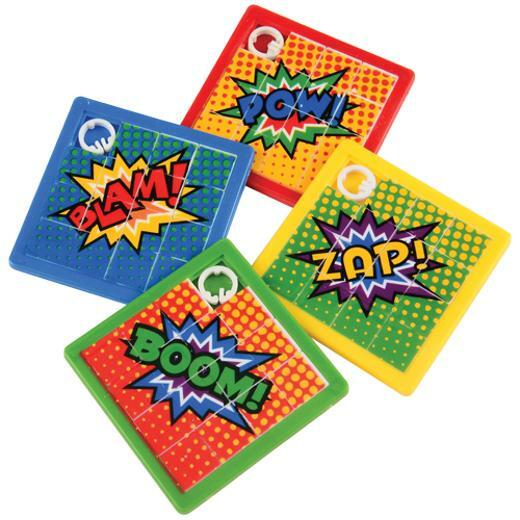 Put your little one's superhero powers to the test with these themed slide puzzles. A great brain teaser for children & adults alike, keep your guests entertained as they try to piece the superhero pop art phrase back together as they slide the 15 squares into place. Perfectly sized for goody bags, these puzzlers will help children pass the time and keep from getting bored. L: 5.9 in. W: 1.0 in. H: 6.0 in.